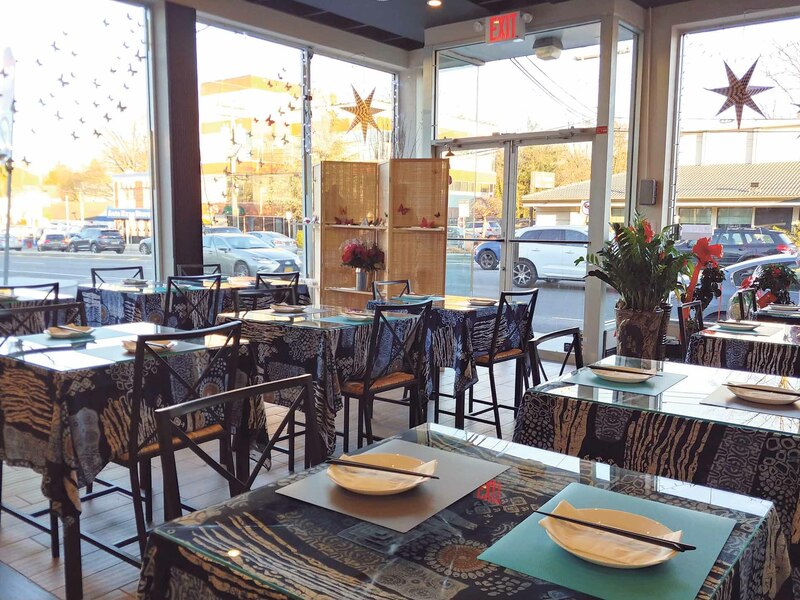 Coco Palace, a new Chinese restaurant on Northern Boulevard, specializes in Yunnan cuisine. Coco Palace, one of Great Neck’s newest eateries, located at 19 Northern Blvd., specializes in an unfamiliar fare—Yunnan cuisine. From the Yunnan Province in Southwest China, the food emphasizes spicy flavors and aromatic ingredients like ginger, banana flower and pineapple. 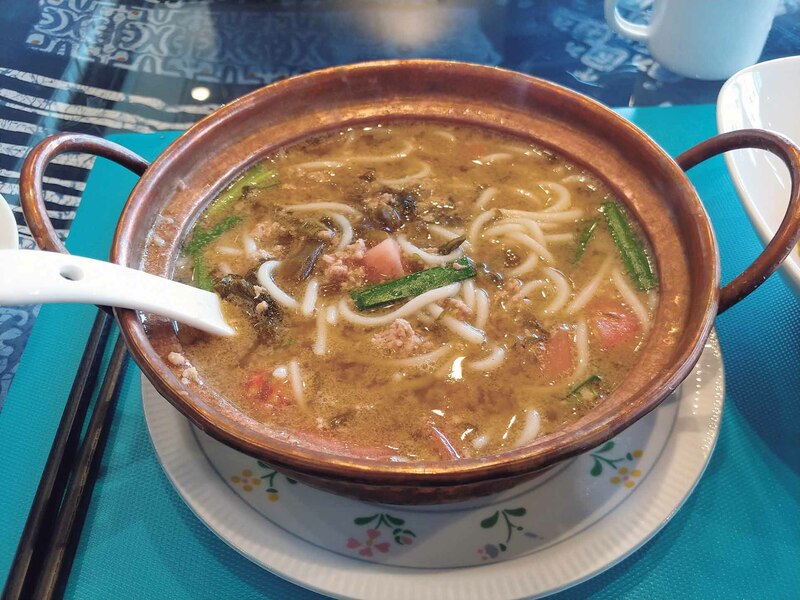 Chefs from Yunnan Province pride themselves on their noodle creations, incorporating rice noodles, called mixian, with savory broth and pungent ingredients like pickled vegetables and chives. Due to its biodiversity, Yunnan Province is known for using unique plants and fungi in nearly all dishes, adding to each one’s freshness and flavor profile. Coco Palace specializes in cuisine from the Yunnan Province in Southwest China, which emphasizes spicy flavors and aromatic ingredients like ginger, banana flower and pineapple. Finding Yunnan cuisine in New York is like finding a needle in a haystack, with only a handful of small and obscure eateries in Brooklyn and Flushing serving up this under­appreciated cooking. 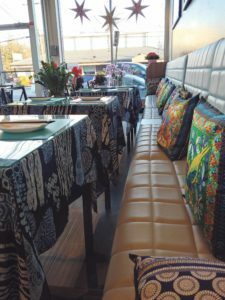 Despite a small language barrier, staff members are very accommodating and knowledgeable about both the menu and the cuisine’s fascinating history. Coco Palace’s decor fuses Yunnan art and design with contemporary elements: Decorative blue and white tablecloths cover each table in the spacious dining room, fresh plants sit near the entrance to give the eatery a somewhat romantic feel, colorful pillows with zodiac imagery line the white cushioned seats on the left of the dining room and traditional Yunnan copper pots sit near the partially open kitchen. 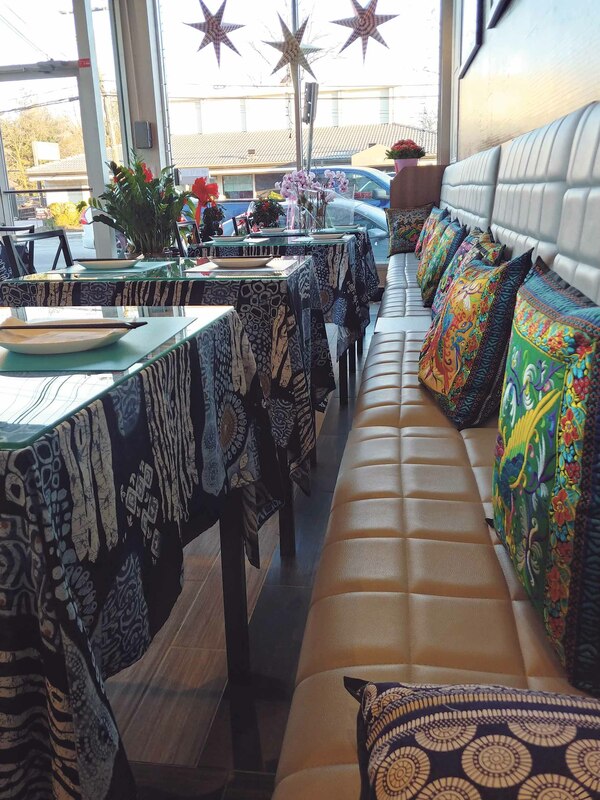 The restaurant’s rather small menu stays true to its Yunnan roots, with many dishes incorporating traditional ingredients and spices native to Southwest China. From Dai-style cucumber salad to eggplant prepared using a Kunming recipe dating back more than a millennium, many appetizers ($5.95 to $12.95) draw from historical cooking practices to create an authentic replication of these classic dishes. Yunnan’s biodiversity is featured in dishes like Yunnan-style fungus salad, buckwheat chips and potato with dry and spicy herbs. Dumplings in spicy and sour sauce have a thin and smooth skin filled with an extremely juicy pork and chive filling. 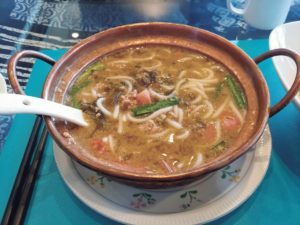 The noodle-heavy entrée menu ($8.95 to $16.95) features mixian noodles prepared in a variety of ways, like in a seafood and pork broth with squid and minced pork, in a spicy broth with brisket and tendon or in a chicken soup called Crossing the Bridge. Coco Palace also features a handful of rice casserole dishes and a few Yunnan specialties, such as grilled whole fish and Yunnan hot pot ($24.95). I started the meal with a cup of slightly bitter Pu’er tea, served in a cute teapot with Chinese writing on it alluding to modern Chinese history. 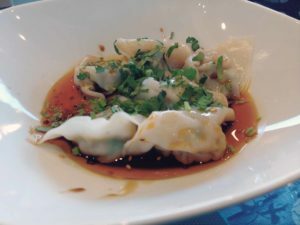 I tried the wonton in a spicy and sour sauce with plenty of green herbs and chives. The dumplings absorbed this pervasive chili sauce extremely well and had a thin and smooth skin filled with an extremely juicy pork and chive filling. The herbs gave the dumplings a fantastic aromatic taste. The Little Pot with rice noodles and minced pork is served in a copper pot that keeps the soup extremely hot throughout the meal. I also ordered the Little Pot with rice noodles, served in one of the copper pots that kept the soup extremely hot throughout the whole meal. The pork bone broth, albeit a bit bland before I added the homemade hot oil, did have a nice pork essence with a hint of tomato and chili. The soup was a little light on the minced pork, but the pork was fantastic with the crunchy pickled vegetables. The hand-pulled noodles were rather thin and extremely smooth. Specializing in such a rare cuisine, Coco Palace hopes to continue serving authentic and traditional Yunnan cuisine, welcoming locals to ingredients, recipes and cooking preparations not seen anywhere else.